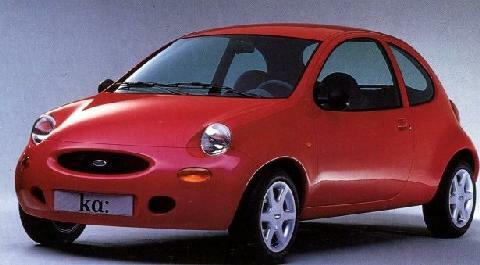 The Ford Ka is a city car from the Ford Motor Company marketed in Europe and elsewhere. The European version is produced in Valencia, Spain, while the one sold in Latin America is built in Brazil. It has been produced since 1996 and is due to enter its second generation in 2009. The car was introduced on September 11, 1996 as a small and low-cost addition to the Ford range. 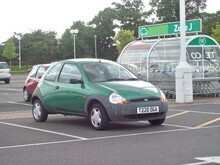 The Ka is based on the same platform as the Mark IV Ford Fiesta, but with a radically different external design. The vehicle was manufactured on the production facility of Almussafes, Valencia. When the Ka was first introduced to the public it provoked mixed reactions due to its original and striking New Edge design, created by Jack Telnack. Besides the styling, the Ka, like its sister cars Fiesta and Puma, was lauded in the motoring press for its nimble handling. Under Richard Parry-Jones's supervision, the suspension and steering settings allowed for spirited cornering and high levels of grip making it one of the best handling cars of the current generation superminis, not unlike the original Mini. The main drawback was the Ka's 1300 cc OHV four-cylinder Endura-E engine, a design dating back to the 1960s Kent engine used in the Ford Anglia. Although not very modern, it provided enough torque to allow relaxed if not spirited driving. In 2002, the Endura-E was replaced by the overhead cam Duratec engine, with claims of improved fuel efficiency and increased refinement, mostly caused by taller gearing on the non-air conditioned models. The Ka has proved highly profitable for Ford despite its low selling price, largely due to the lack of spending required in its development. It has been the best selling car in its class in the United Kingdom for a number of years and commands around a fifth of the city car market. The United Kingdom model range consisted of the standard version, the Ka, and the higher specification Ka². The Ka³ was introduced later. Initially, all Kas were delivered as the standard model and upgraded to the higher variants at Ford dealerships, saving on production costs. However, this practice was dropped following the renaming of the Ka² and Ka³ as the Ka Collection and the LuxuryKa (later Ka Luxury). These offered colour-coded bumpers for the first time, although this lost the designer's original intention of the black plastic bumpers avoiding parking damage to paintwork in city conditions. The Luxury version came with a Quickclear heated windscreen, leather seats and interior trim as well as standard air conditioning and Ka Sun Collection with a full-length fabric folding roof was also added to the range during the summer months. A revised line-up gives Ka the following trim levels in the United Kingdom: Studio, Style, Style Climate, Zetec Climate, and SportKa SE. Furthermore, acknowledging the car's impending replacement, as of May 2008, a Finale special edition is available with distinguishing features. Famous Manchester United footballer Wayne Rooney is known to own one.